Today in Masonic History Walter Wolfkiel Bacon is born in 1880. Walter Wolfkiel Bacon was an American politician. Bacon was born in New Castle, Delaware on January 20th, 1880. At age 8 he was selling newspapers. He graduated from New Castle High School and went on to Beacom College in Wilmington, Delaware. Bacon essentially had two careers, his private sector life and his political life. In Bacon's private sector life he worked first for U.S. Steel in Chester, Pennsylvania and then in Philadelphia. He then moved on to the Repauno Corporation which was later acquired by the DuPont Company. Later he moved on to work for General Motors in their Michigan Division. He became Treasurer of the Buick Motor Company in 1918. He retired from the company in 1930 at the young age of 50. It was at that time that he returned to Delaware to begin his life in the political arena. 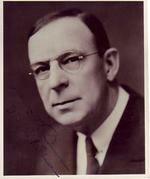 In 1935, Bacon won his first term as Mayor of Wilmington. He would gave two more successive terms as mayor. In 1940, Bacon ran for and won the office of Governor of Delaware. He would be the first and only mayor of a Delaware city who also served as Governor. He would be elected to a second term in 1944. The terms of Bacon as Governor were largely dominated by the events of World War II and the events that followed. During the war U-Boats patrolled along the United States coast and there were multiple sinkings off of Delaware. Despite many things becoming scarce. In Delaware the two things that were not lacking were broiler chicken and vegetables. The vegetables were grown in what were called "Victory Gardens" all over Delaware. Chickens were so abundant in Sussex county that price controls put in place on the federal level caused a black market for the chickens to emerge. The United States Army came in and locked down the county to ensure there were going to be enough chickens for the Army. Bacon is said to have been the right man at the right time in reference to his time as Governor. Known as a frugal man, he managed a $13 million budget for the state and was very proud of the fact that the state doubled it's cash balance during his tenure. He was the first Governor to work regular hours from 8:30 to 5:00. There were also social changes going on when Bacon was Governor. The "blue laws" were more and more being challenged and the Delaware legislature refused to move on them. The Delaware Attorney General ordered the statewide arrest of some 500 people for violations of the "blue laws". When the names of the individuals arrested were printed in their local papers the laws began to change. Bacon passed away on March 18th, 1962. Bacon was a member of St. John's Lodge No. 2 New Castle, Delaware.